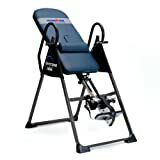 Here at InversionTherapyHQ.com we pride ourselves on providing you information on the best inversion tables, so that you can be sure of getting the right inversion products for your needs. Big or small, we will help you find a table perfect for your use. The market is flooded with inversion products, as inversion therapy has proven to be very popular. With the abundance of available brands and models, it can be incredibly tough to pick the correct table. That is where InversionTherapyHQ.com and our highly regarded inversion table reviews come into the picture. After many reviews, we have compiled a list of the 5 best inversion products on the market today. It wasn’t easy to pick just 5 tables for our list, but we managed to do so in the end. There are some brands who didn’t make it into the top 5, and we should give an honourable mention to Health Mark, Body Power, Body Max and Emer. They all make some good products, but in the end we just couldn’t find a spot for them in the top 5 inversion tables of 2018. This entry level table is sturdy and well built. It is easy to assemble and just as easy to use. On top of that, it comes in at just over $200 (although there has been some deep discounts recently). Is this the best inversion table on the market? No, it is not. But is deserves a spot in this top 5, because it offers really good value for the money for anyone wanting to try out inversion therapy. Teeter is one of the best known inversion brands around, and with good reason. The EP-560 table is aimed more towards the beginner inversion crowd, while the EP-950 below is their flagship product. What do you get with the EP-560? A well put together product that won’t break the bank. The EP-560 also features adjustability, meaning the whole family can use it to relieve their back pain. The 950 is the flagship of the EP range by Teeter. Patented Flex Technology allows the table to move with your body, which in turn leads to improved posture, and less back pain for you. WIth a weight capacity of 300lbs, it is one of the sturdiest tables on the market. For such a sturdy table, it is surprisingly compact to store. When you are done with your daily inversion session, just collapse the table and fold it like a step ladder. It will easily fit behind most doors, or even underneath a bed. Many chiropractors recommend the 950 above other brands, and while I believe it isn’t quite my nr 1 recommendation, you could certainly do much worse. The High Capacity Gravity 3000 can accomodate users of up to 350 pounds, and 6 feet 6 inches in length. Not many tables on the market that can say the same. Even though in can handle larger users, this unit offers adjustability for users who measure in at 4 feet 10 inches. This truly makes it a product for the whole family. As we have come to expect from Ironman by now, the HC 3000 is sturdy, well made and easy to use, just like the other tables in their range. This table does require quite a bit of space, and it does take some time to fold up for storage. So much so that I would recommend this table only to users who will leave the table in one spot. This unit is not made for regular folding and unfolding for storage purposes. Having said that, this table has a lot going for it. The padded back board is constructed from memory foam, and users are raving about how comfortable it is. Ironman has also gone to great lengths to ensure that the ankle holders on this table (and the others in their range) are top notch. None of those foam type rollers, where your feet are constantly slipping out. The adjustment settings, and the sturdiness of this table, makes it a great option for a family of all shapes and sizes. Our number 1 recommended table is the Ironman Gravity 4000. This inversion product is usually priced at $349, and while that price may seem a bit steep, it is the best product on the market in my opinion. Check out our full Ironman Gravity 4000 review here. Why pay $350 for the Gravity 4000? Well, its construction is both rugged and uncomplicated. Believe me, there are some unassembled tables out there that would stump Einstein if he was still breathing. If you weigh 350lbs and measure in at 6’6”, this is the table for you. No need to worry about the table being too small, or not sturdy enough. You simply can’t go wrong with Teeter inversion tables. They make some of the best inversion tables on the market, and although I personally prefer Ironman inversion tables, there isn’t all that much too choose between the two. Hands down my favourite brand, and in my opinion Ironman makes the best inversion tables on the market. From their entire range, I think the Ironman Gravity 4000 is the absolute standout. Inversion Therapy is a new form of holistic science therapy. It brings balance to the body, and creates harmony between the physical, emotional and mental sides. Used correctly, it can improve posture, relieve back pain, and do so much more. I firmly believe that the Gravity 4000 by Ironman is the best inversion table for the money. I will add that choosing between the Gravity 4000 and the Teeter EP-950 might very well be just a case of picking the one that looks best to you. A few years back I experienced some lower back pain. I was told this was because I spend most of my day behind a desk. This lead me to inversion therapy, and I am smiling ever since! With this site I hope to share my knowledge with you, and hope to help you get rid of your back pain as well. Copyright text 2015 by Inversion Therapy HQ.